Our monthly Khuddam dinner was held on November 17th, 2012 at 6pm. The program began with Maghrib and Isha prayers, followed by a potluck dinner and short presentation by Waqas Syed on his visit to Rabwah. Approximately 30 Khuddam were present. 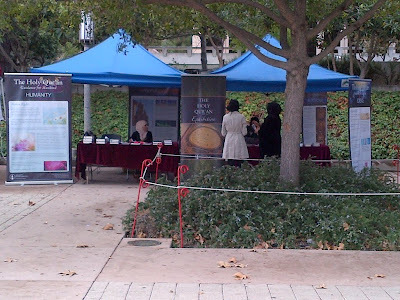 On November 8, 2012, the UC Irvine AMSA held an on campus book fair. The event was organized by LA East Lajna with the support of the UC Irvine AMSA. On November 10th, 2012, approximately 10 Khuddam gathered at the Mosque at 8am to setup the new basketball hoops. The setup took approximately four to five hours. On November 4th, 2012 we held our general meeting at Bait-ul-Hameed Mosque. Twenty-eight Khuddam were in attendance. During the meeting Qaid Sahib discussed his plan to standardize the Khuddam calendar. Tarbiyyat nights will be held on the 1st and 3rd Friday of each month and Khuddam dinners will be held on the 4th Saturday of each month. In addition, general meetings will be held on the second Sunday of each month. Pictures from the meeting will be uploaded soon.